7/1 Cup of Coffee: A pair of June's top performers on the mound finished off the month in style. Anthony Ranaudo (pictured, right) led Pawtucket with seven dominant innings, and Gerson Bautista did not allow an earned run in the DSL Red Sox win. Salem won with a walk-off homer in the bottom of the 10th, and the GCL Red Sox prevailed in a slugfest. Portland came out on the short end of a pitchers duel, and Greenville also fell in its contest. 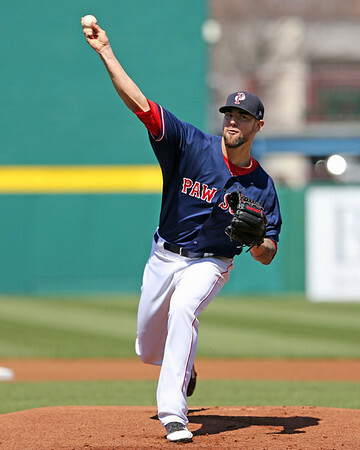 Little went wrong for Pawtucket in its 10-0 blowout of the Durham Bulls (TB). Anthony Ranaudo gave up just three hits in seven scoreless innings, striking out five and walking two. The 6-foot-7 righty lowered his ERA to 2.35 by holding his opponent scoreless for the fifth time in his last nine starts. In his last five starts, Ranaudo has a miniscule 0.85 ERA and 0.663 WHIP. Dalier Hinojosa struck out two in his inning of relief, and John Ely closed out the game with a scoreless ninth. Andres Torres delivered his first home run since joining the PawSox, a no-doubt three-run blast in the third inning. Alex Hassan was 2 for 3 with two doubles, a walk, and four runs driven in. Dan Butler, who had been scuffling some at the plate this season, delivered his second straight three-hit game. Butler also doubled and drove in two. Christian Vazquez scored three times, going 1 for 2 with a pair of walks. Portland failed to capitalize on a number of chances in a 2-0 loss to the Trenton Thunder (NYY). The Sea Dogs were 1 for 10 with runners in scoring position. Blake Swihart (2 for 3 with a walk) and Derrik Gibson (1 for 2 with two walks) were both on base three times and were the only Portland players to reach third base, but neither made it home. Luis Diaz took the tough-luck loss, giving up two runs on seven hits in six innings, striking out three and walking two. It was the first loss for Diaz in three starts since his promotion from Salem. Noe Ramirez threw two perfect innings of relief, striking out three. Ryan Dent (pictured, left) and Salem walked off against the Wilmington Blue Rocks (KC) 7-5 in 10 innings. Knotted at five, Aneury Tavarez singled with one out. That brought Dent to the plate, who ripped a two-run game-winner over the left field wall. In addition to his third home run of 2014, Dent was 2 for 4 with a walk. Jantzen Witte doubled twice and now has 28 on the year between Greenville and Salem. Jose Vinicio, who spent 10 weeks on the disabled list, doubled for his first hit since Opening Day. On the mound, starter Corey Littrell took a no-decision despite a solid performance. The 2013 fifth rounder allowed three runs on eight hits in his seven innings, striking out five and walking two. Kyle Kraus got the win, giving up two unearned runs in three innings. Kraus allowed only one hit and struck out four without issuing a walk. Greenville fell to its seventh straight loss, losing 10-3 to the Hickory Crawdads (TEX). Teddy Stankiewicz allowed six runs for the second consecutive outing. The 2013 second-round pick gave up nine hits in his four innings of work, including a three-run homer. He struck out four and walked one. Taylor Grover struck out five in three innings of relief, but also gave up a pair of solo home runs. Wendell Rijo scored two of the Drive's three runs, going 1 for 3 with a double and a walk. The calendar flips to July with Rijo on a five-game hitting streak. Kendrick Perkins also doubled as part of his 1-for-2 evening. The GCL Red Sox pounded out 16 hits in an 11-8 win over the GCL Orioles. Ben Moore made his professional debut in style. The recently-signed eighth-round pick out of Alabama got the start at DH and was 2 for 4 with a double, walk, two runs scored and two RBI. Jordon Austin, who snapped a vicious 0-for-21 streak on Saturday, had a monster game for the Sox. Austin was 3 for 5 with two doubles, a stolen base, three RBI and a pair of runs scored. The middle infield also made a huge contribution, as shortstop Javier Guerra and second baseman Hector Lorenzana had three hits apiece. Javier Rodriguez, a 19-year-old left-hander out of Mexico, was solid his first start of the season. Rodriguez allowed three runs (two earned) on eight hits in six innings. He struck out two and walked one. Yankory Pimentel struggled in relief, giving up five runs (three earned) in 1 2/3 frames, but K.J. Trader tossed a scoreless 1 1/3 to pick up the save. With an 8-2 win over the DSL Orioles2, the DSL Red Sox remain tied for first place in the Boca Chica South Division. Gerson Bautista took the mound for the Sox, and continued his stretch of excellent pitching. He allowed only one unearned run in his five innings, finishing June without giving up a single earned run across 26 innings in five starts. He allowed two hits, only the second time this season he has given up more than one, while striking out four and walking two. However, despite his dominance, he has yet to record a win. That stretch of bum luck continued as he departed on Monday with the score tied at one. The win went instead to Algenis Martinez, who delivered a solid outing in his own right. Martinez allowed a run on five hits in his four innings, striking out six without issuing a walk. Rafael Devers was again at the center of the offensive attack. The third baseman was 1 for 2 with two walks, scoring twice, driving in a run and stealing a base. The Sox blew the game open with a five-run eighth inning. Roldani Baldwin and Gerardo Carrizalez both hit their first professional home runs in the inning - Baldwin with a two-run homer and Carrizalez with a three-run shot. Player of the Day: Anthony Ranaudo seems to have taken up residence in the Player of the Day space every fifth day. The 2010 first-round pick out of LSU is in the midst of his best professional season, with a 2.35 ERA and 1.160 WHIP, striking out 81 in 95 2/3 innings. In recent starts, Ranaudo has limited the walks that he struggled with early on in the season. He walked two on Monday, the fifth straight outing where he has walked two or fewer batters.